Grilled Corn + Cheddar Quinoa. I’m having this little issue… that’s involving not being able to close my eyes at night. I’m so ahead of myself that I’m behind. See what I’m dealing with here? Oh and guess what? I’m really fun to live with!! I’ve always been an early-to-bed, early-to-rise type of gal, moreso because I’ve never been cool enough to do anything, well… cool, late at night. And if I sleep in really late, then I start having anxiety about not getting anything done and wasting the day away. The OMGs just start all over again. Like, constant. Yes yes, super fun to be in my presence 24/7. So. This is the story of how real life tells me I am going to marry Ryan Gosling and live in a shack when I grow up. Because last night when I couldn’t sleep… I ended up playing MASH. With myself. And playing MASH at the age of 29, while lying awake in your marital bed… is sort of different than playing MASH at the age of 12, while sitting at your 6th grade desk, elbows propped up on your trapper keeper and silk shirt sticking to your back because air conditioning like, wasn’t invented back then or something. And it gets even weirder, because then you’re like, supposed to pick four names to play MASH with – people you crush on and want to marry and people you really don’t like and really don’t want to marry?? But you feel like a giant creep because you already are married and so are some of the other people you know, so instead you write down names of your secret-brain boyfriends, that have unknown, uncommon names. Like George Clooney. Oh and you definitely don’t write down names of boys that are in boy bands and stuff, because at some point, regardless of how exhausted you are, you remember that they ARE DECADES YOUNGER THAN YOU. Um. Mistake. Depressing mistake. I seriously don’t know how I’d manage in middle school these days, because there is absolutely no way that some computer game could satisfy me like folding my notes into tiny paper footballs, making origami fortune teller finger-things and playing MASH did. I want a paper and pencil, not a hand and a keyboard please. Oh… wait… you want to know about this quinoa? I dunno. I made a lot of quinoa last week. I even made some KALE that I’ll tell you about. What whaaaat. Weird. Last year I freaked out over grilled corn. This year I’m continuing the freaking. I mixed it with some quinoa, but while the quinoa was still hot, I folded in a bunch of this incredible organic white cheddar that made it so crazy creamy and packed it with flavor. So few ingredients but such a taste explosion, it’s almost seems totally unfair. It’s way too easy. It’s an awesome side dish. And it’s definitely what I’m going to eat in my shack tonight. So there. Preheat your grill on the highest setting. Shuck corn ears and brush each with olive oil and sprinkle with 1/2 teaspoon of salt and pepper. Wrap each in a square of aluminum foil – just so there is one layer cover the corn. Grill for about 5 minutes each “side” – rotating corn 4-5 times during grilling. Once corn has cooled, cut the kernels off the cob. Add quinoa and chicken stock to a saucepan and bring to a boil. Once boiling, reduce to a simmer, cover and let cool for 15-18 minutes, then fluff with a fork. Immediately stir in butter, cheddar and remaining salt and pepper. Add in corn and stir to combine, then top with a bit of fresh cilantro. Serve! P.S. this is also wonderful with jalapenos! I did that. Later. By accident. This looks SO good. 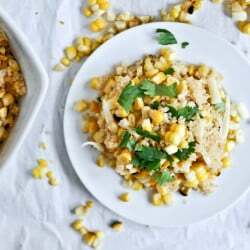 And as luck would have it, I was just gifted with tons of fresh corn today so I’m definitely making this for dinner! nom nom nom. just made this tonight- turned out AMAZING! i added one jalapeno and some red onion- everyone loved it! thanks again for the abundance of delicious recipes! OMG! I CANNOT even tell you that you sound exactly like me! I really was starting to feel like I was the only person like this. Everyone just thinks I am crazy. Stupid anxiety just gets the best of you and we are totally the same age. We could be friends, but then there might be to much crazy. Hmm. I will think about it. But I love you right now. Just made this tonight and it was great! I used frozen corn as we’re done with the fresh cobs for the season, but it worked out fine. The cilantro and cheese combo-wow, so good. Thanks for this recipe and I’m looking forward to trying others on your site. Your recipe is great, but why include the personal psych stuff?? Too weird nd pointless and irrelevant . Post it on an appropriate site and keep recipe sites for recipes. Just made this and OMG It’s delicious! Also, I think I’m starting to enjoy grilling things over my gas stove. This looks DELICIOUS!!! But I love your story, haha, best recipe I’ve ever read!!! How do we think this would be with canned corn? I don’t have access to a grill and would love to make this!